This page lists first steps you can take after installing eZ Platform. These are most common actions you may need to take in a new installation. To go through a full tutorial that leads from a clean installation to creating a full site, see Building a bicycle route tracker in eZ Platform. 1. Go to the Back Office: <your_domain>/admin. 2. 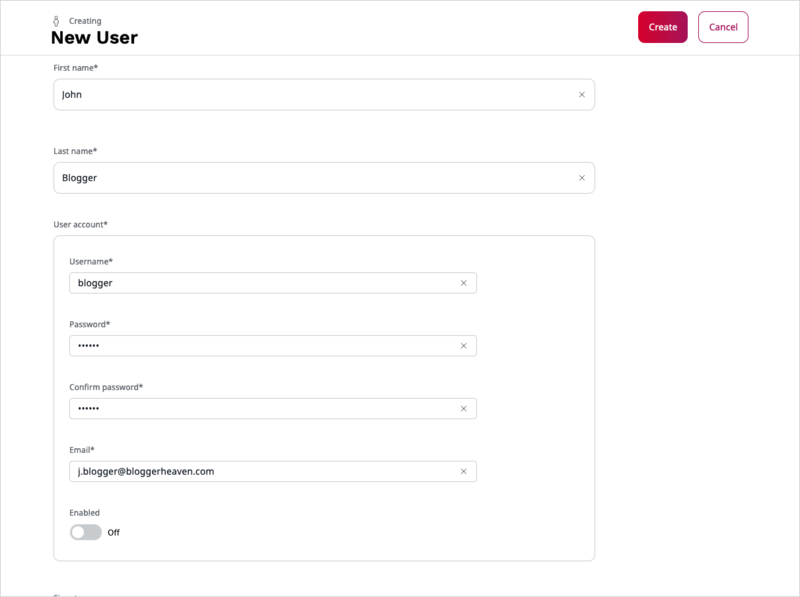 Select Admin and go to Content Types. 3. Enter the Content group and create a new Content Type. 4. Input the Content Type's name, for example "Blog Post", and identifier: blog_post. 5. Below, add a Field definition of the type Text Line. Name it "Title" and give it identifier title. 6. Add another Field definition: Text (type Rich text) with identifier text. 7. Save the Content Type. To display Content in the front page you need to define content views and templates. Content views decide which templates and controllers are used to display Content. Content view templates use the Twig templating engine. 1. Go to the Back Office, activate Content/Content structure and create a new Content item using the button in the right menu. 2. Select a Blog Post Content Type. Fill in the Content item and publish it. 3. To preview the new Content item on the front page, go to <yourdomain>/<Content-item-name>. For example, if the title of the Blog post is "First blog post", the address will be <yourdomain>/first-blog-post. You can use SiteAccesses to serve different versions of the website. SiteAccesses are used depending on matching rules. They are set up in YAML configuration under the ezpublish.siteaccess.list key. The SiteAccess will automatically be matched using the last part of the URI. 2. You can now access the front page through the new SiteAccess: <yourdomain>/de. At this point you need to log in to preview the new SiteAccess, because an anonymous visitor does not have permissions to view it. See section about permissions below. For now the new SiteAccess does not differ from the main site. One of the most common use cases for SiteAccesses is having different language versions of a site. This means that German will be used as the main language for this SiteAccess, and English as a fallback. 2. Go to the Back Office and select Admin > Languages. Add a new language called "German", with the language code ger-DE. Make sure it is enabled. 3. Next, go to the Content structure and open the blog post you had created earlier. Switch to the Translations tab and add a new translation. 4. Select German and base the new translation on the English version. Edit the Content item and publish it. 5. Go to the front page. The blog post will now display different content, depending on which SiteAccess you enter it from: <yourdomain>/<content-name> or <yourdomain>/de/<content-name>. The design engine enables you to use different themes consisting of templates and assets. Each theme is stored in a separate folder and assigned to a SiteAccess. This means that the app will look for the blog_post.html.twig file in a folder relevant for the SiteAccess: de_design for the de SiteAccess, or site_design for other SiteAccesses in site_group. 5. Create a themes folder under app/Resources/views, and two folders under it: de_design and site_design. 6. Move the existing full\blog_post.html.twig file under site_design. 7. Copy it also under de_design. Modify the second one in any way (for example, add some html), so you can preview the effect. To allow a group of users to edit only a specific Content Type (in this example, blog posts), you need to set up permissions for them. 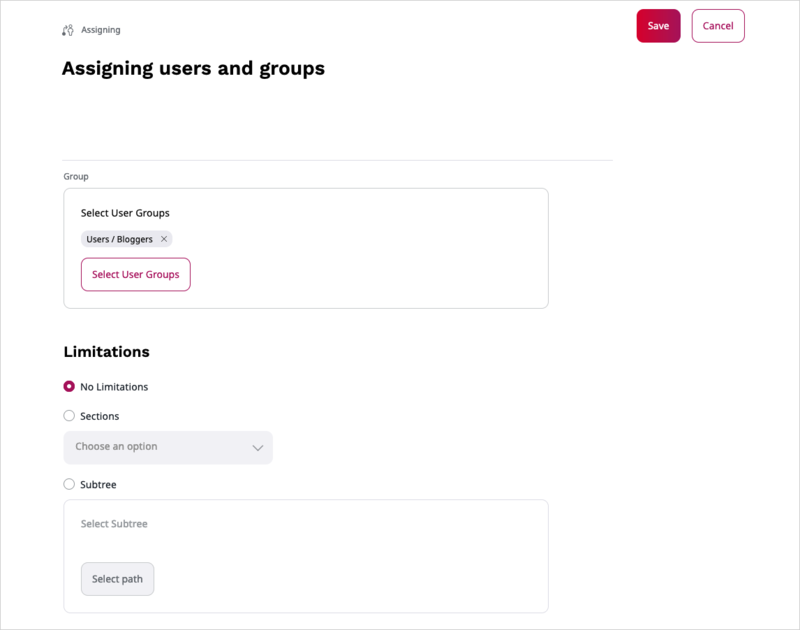 Users and User Groups are assigned Roles. A Role can contain a number of Policies, which are rules that permit the user to perform a specific function. Policies can be additionally restricted by Limitations. 1. Go to Admin > Users. Create a new User Group (the same way you create regular Content). Call the group "Bloggers". 2. In the new group create a User. Remember their username and password. Mark the user as "Enabled". 3. Go to Admin > Roles. Create a new Role called "Blogger". 6. In the Assignments tab assign the "Blogger" Role to the "Bloggers" group. You can now log out and log in again as the new User. 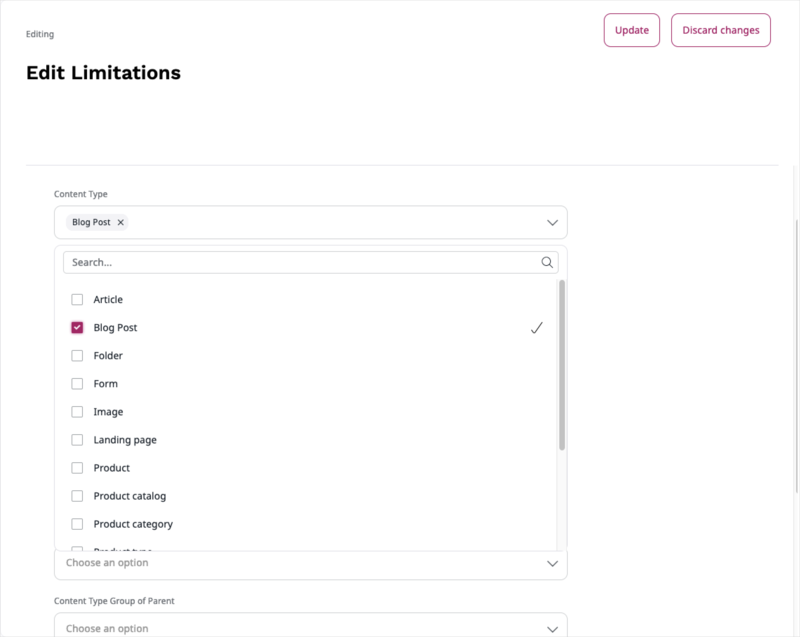 You will be able to create Blog Posts only.